The following suggestions can help you work with and around many of the challenges of long-distance caregiving. Get organized. The following tips can help you stay on top of your caregiving tasks. Collect and sort information about the medical, financial, and legal needs of the person with cancer. This will help you and others make informed decisions. Some people use a binder or file folder to keep track of everything. Make sure that the correct legal documents, such as advance directives, are completed and given to those who need them. Discuss the documents with family members. This will allow you to make medical and/or financial decisions if the person with cancer is unable to. Learn more about managing the cost of cancer care and managing someone's cancer care. Introduce yourself. If possible, call the health care team members involved in the care of the person with cancer. Let them know that you play a key role in providing care. Give them your phone number(s) and other contact information in case they need to reach you. You may need to sign a release or have the person with cancer’s permission to discuss medical conditions and treatments. It may be helpful to have the patient record consultation appointments to help you better understand the treatment options discussed. You can also ask the health care team if you can call in to the appointments. Explore professional home care services. Contact the person's health care team, social worker, state or local health department for referrals to reliable home care services. Home care services can range from providing basic medical care to assisting with household tasks, meals, and personal care. Talk with the person's insurance company about which, if any, home care services are covered. Contact family, neighbors, friends, and members of religious, civic, and social organizations who may want to help with caregiving tasks. Use online resources to list specific tasks the person with cancer needs help with. Through these sites, your family and friends can volunteer and coordinate tasks. This is also an easy way to keep a large group of people updated. 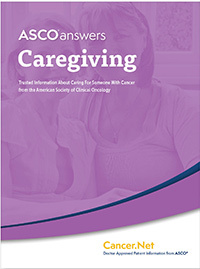 In the ASCO Answers Guide to Caregiving (PDF), you can find helpful charts to keep track of the tasks the person with cancer needs help with and who is available to help. Prepare for unplanned travel. Be prepared to travel if the person with cancer needs your help. Set aside vacation or sick days from work. Research travel options and make plans for ground transportation and accommodations. Choose a friend or neighbor to help pick up mail, water plants, or care for your home in case you need to leave suddenly. Arrange for someone to help care for your own family while you are away. Provide and seek emotional support. It’s important for caregivers and the person with cancer to find ways to cope with their emotions. Regularly reassure the person with cancer of your continued support. You can do this through phone calls, letters, e-mails, or other ways. Many long-distance caregivers feel guilty about living far away from the person with cancer. Or they may feel overwhelmed by the challenges of coordinating care from afar. Seek out support for yourself from family, friends, or a counselor to help deal with stress and emotional struggles. Meet with a member of the medical team. Set up an appointment with the person's health care team to discuss the medical issues and care plan. Before the trip, prepare a list of questions for the health care team. If possible, include the person with cancer in the discussions. Meet with the person's informal support network. Arrange to meet with friends, neighbors, and members of community organizations who are providing care. Ask if they have any concerns or suggestions on ways to improve care. Try to keep an open mind about what they say or suggest. Also, ask that they contact you right away if they notice any problems. Schedule a break for the local caregivers. If possible, plan to take over some of the local caregivers' tasks. This provides local caregivers with some relief. It also gives you the chance to reassess the caregiving needs and resources first hand. Observe the person's condition and the condition of the surroundings. Is there food in the refrigerator? Is the house clean? Is the person bathed and groomed? Spend time talking to the person with cancer about their feelings regarding their care. Take time to reconnect. Schedule quality time with the person with cancer. You can do this by enjoying activities that you like together. Discuss end of life care. During a visit, try to find an appropriate time to discuss the person with cancer’s end of life wishes. You may want to do this with other close family members around so that everyone understands the person’s wishes. This can be helpful, especially when a person has advanced cancer.